The largest estate in County Longford, Castleforbes demesne has been home to the Earls of Granard since the early seventeenth century. 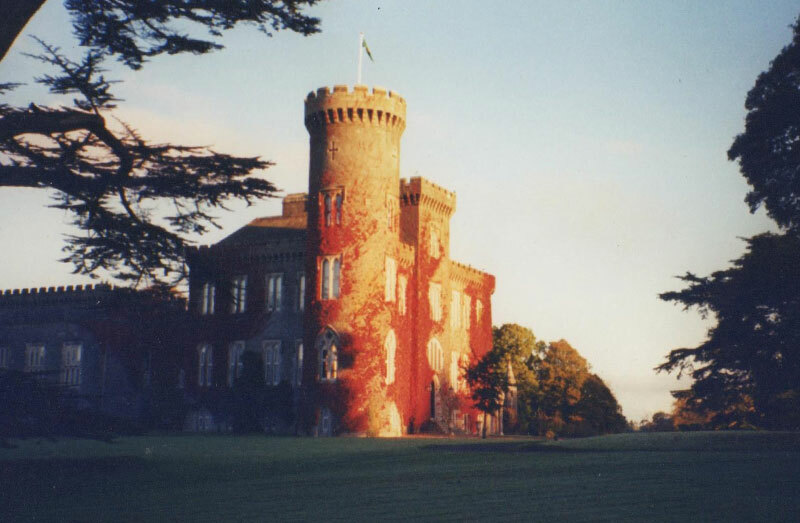 The castellated neo-Gothic Castle, in the style of the better known Tullynally Castle in neighbouring Westmeath, forms the centrepiece of a complex assemblage of historic buildings which still serve a working demesne with more than 20 people employed. Bordering Lough Forbes, a lake shaped by a broadening of the River Shannon, the estate’s ancient woodlands are protected by European and national designations. The neighbouring protected raised bogs, located on the south-eastern shore of Lough Forbes, are of international importance as unique examples of the most northerly Shannon River edge bogs, a haven for migratory geese and merlins which forage intrepidly in the woodland glades. The first records of the woodland date from 1682, where a visitor: “found growing there in great order large groves of fir of all sorts, with pines, juniper, cedar, lime trees, beech, elm, oak, ash, Asp (aspen) and the famous platanous [vast oriental plane] tree”. Generations of the Earls of Granard have managed the woodlands, introducing rare European ash, unique American sequoias (western redwoods) – now almost a hundred years old – periodically renewing the ancient broadleaf woodlands. Under the late Lord Granard, the public enjoyed the benefits of the estate and its woodlands, with regular shoots for the Earl’s private guests. After his death in 1992, his daughter, Lady Georgina Forbes, took up residence in 1994. A successful owner of international showjumping horses, described as a “blue-blooded animal-lover”, she called a halt to the game shooting. Publicity-shy, she instituted a policy of no admission to the public, closing the imposing gates and retreating to her isolated cottage at weekends with her twelve dogs. The undisturbed ancient woodlands attracted the attention of Scottish Woodlands, a forestry management company from the UK. In 1998, one of their representatives was made a Director of Rawden Estates, Castleforbes Estate’s legal entity. The shareholding of Rawden Estates is divided between the ‘Skerry Foundation’, with an address in Luxembourg (3,371,759 shares) and Mark Connellan, the Secretary and Director of Rawden Estates since 2004 and State Solicitor for County Longford (3 shares). Rawden Estates increased its authorised share capital from €10m to €15m in March 2012 and from €15m to €18.125m in December 2013. In July 2014, furniture from the castle was sold at Christie’s, one table alone netting €606,066. In November 1998 the estate was approved for a Woodland Improvement Scheme grant from the Forest Service which in this case does not seem to have required much planting. But what transpired was not the improvements intended through management measures for Annagh Woodland, the most valuable of the woods, but – according to a so-far reliable, anonymous source who contacted the author – a “free-for-all, as access was fully available, timber was being stolen left, right and centre and Rawden Estate never received a penny”. 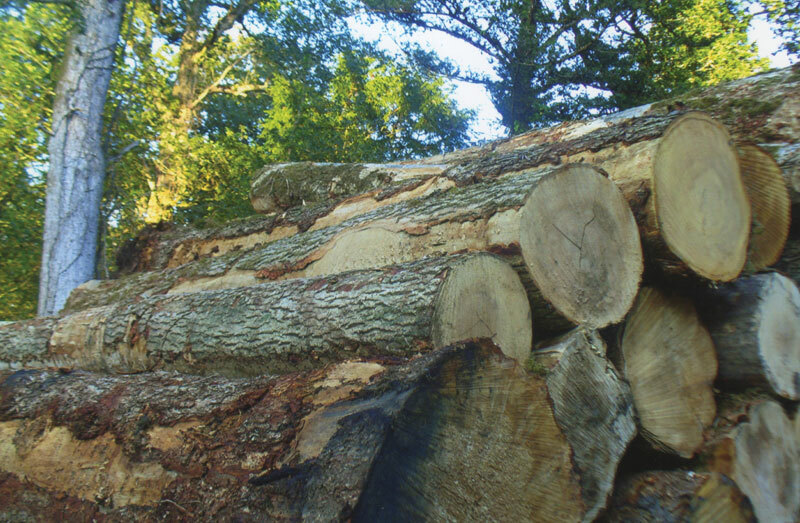 The felling included “specialised machinery brought in so that the oak trees could be removed in full lengths [and] these were later shipped to Scotland for auction”. The Forest Service records show that no felling licence was applied for at that time. At current rates with the additional seven-year Woodland Premium the grant payments for the 86.7 hectares ‘improvement’ would cost the State over €645,000. When the situation was brought to Georgina Forbes’ attention, the felling was halted, and after some legal manoeuvrings Scottish Woodland resigned in 1999. Encouragingly, the management of the woodlands was given to Greenbelt, a leading Irish forestry company, which has been properly addressing the issue of invasive species – ironically brought in by the family as a cover for game-shooting many years ago. Greenbelt’s last documented payment was in 2012. Rural memories are long and when Scottish Woodlands re-emerged in 2014 those who had watched the destruction in 1999 were horrified. The company applied for a thinning licence for Annagh Wood. The local authority showed concern, noting that “This area of mature broadleaf runs along the shore of Lough Forbes on the Shannon River system and is a most scenic and beautiful part of Longford and Ireland”. Scottish Woodland explained in its licence application that it managed the demesne through “low Impact Sylvicultural Systems” which it explained means that it is managed according to “close to nature principles”. It would “encourage and promote natural regeneration by increasing air movement and UV levels unto the woodland floor”. “The resultant timber”, it wrote, “would be extracted by forwarder to roadside where it would be sold as firewood”. “On inspection of this area, mature specimens of Oak are found along the perimeter of these plots. These trees are estimated to be approximately 70 years old and have developed well. The soils in this area are clearly capable of carrying deciduous trees. Replant area with native trees. Leave all Oak, Holly, and Rowan standing”. The NPWS [National Parks and Wildlife] Ranger met Scottish Woodlands on site as operations were beginning in December 2014 because the licence conditions had to be revised. There were “no resources in the NPWS to carry out the survey (as required in the original conditions)”. Scottish Woodland said they would mark the trees themselves and reiterated to the Ranger that “the wood claimed from this felling would go to the firewood industry”. restrictions to firewood, or of the clear prohibition on the removal of these oaks. The matter was never referred to the Forest Service, in spite of its role as the licensing authority. Nor, again tellingly, did the Minister ever provide the Deputy with an answer. Despite having lost his Fine Gael seat in the last election, Bannon – one of whose associates was accused of stealing his opponents electioneering leaflets from letter boxes – refused to be interviewed on the lost parliamentary reply on the grounds that he did not “want to embarrass my Minister”, – at least not any further, one presumes. 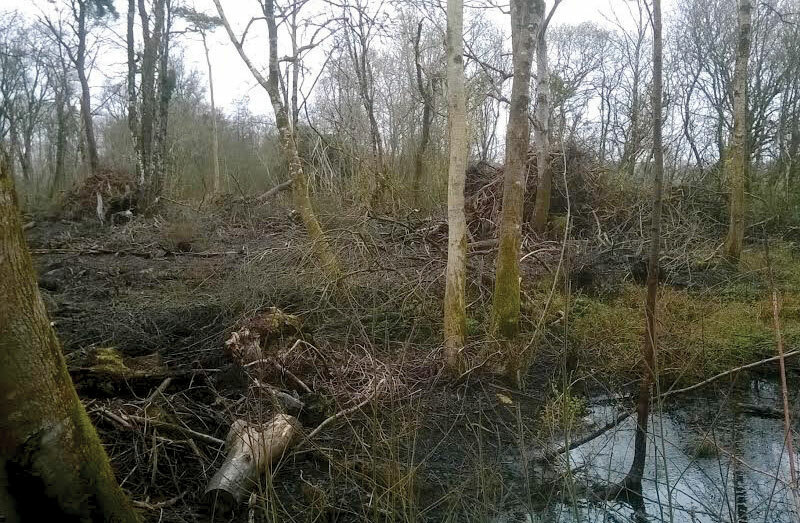 The simmering resentment over the felling at Annagh Woods in November 2015 undoubtedly fuelled the extraordinary public outrage when Scottish Woodland arrived in 2016 to cut into another woodland, this time at the most sensitive time of the year. Signs showing the company’s plans were defaced and removed. The orange paint, intended for marking the trees to be protected, was used to daub the castle wall with IRA slogans. The previous 2014 ‘firewood’ licence had been referred by the Forest Service to the NPWS which imposed a condition requiring that no works take place during the March to September breeding season. Now, one of the two new licences was returned by the NPWS regional management to the Forest Service with no comment and the other was not even sent to the NPWS by the Forest Service as required. As work got underway, a distraught Ranger met the local Forest Service Inspector on 24 March, outlining “the presence of pine martins, breeding buzzards, suspected breeding woodpeckers” – which had started to colonise Ireland on the east coast only in 2008 – “breeding red squirrels, breeding ravens and many other species of countryside birds”. They agreed to seek a stay on the works until September. The NPWS Ranger appealed to her line officer in urgent emails. “As we speak, drays of red squirrels, nests of buzzards and the nest of woodpeckers, dens of pine martens are the subject of destruction”. According to the NPWS Regional Manager the Ranger had been “undermined and embarrassed” by the breakdown in the system that had left her unaware of any new licences. “Can you please find out why this important application did not reach my desk?”, she asked the NPWS line manager who replied that she was going on leave that evening and so unable to meet anyone or arrange for an assessment – and for this reason seems to bear more responsibility than anyone for the debacle. The Ranger states: “I phoned the forester who said he will stop the felling immediately if requested. Can you advise if I can stop the felling?”. She was told, accurately, by her line manager: “that the NPWS cannot stop such works and that is in the remit of the Forest Service [alone]”. Work was in fact suspended by the Forest Service on 24 March, but the ensuing review approved resumption on the 12th of April, citing the flooded nature of the woods as one of the reasons to permit work in the drier breeding season, and pointing out that licensed forestry felling was exempt from the breeding-season restrictions that applied to landowners. As to the woodpecker, while the presence of a pair was confirmed “no evidence of breeding was found”, according to the Department, belying the Ranger’s report of the “nest of woodpeckers”. Work resumed on 25 April, a day after the Minister for Agriculture received what was to be two letters from the NPWS under the Forestry Consent Regulations seeking a suspension of the licences until September. In fact, the NPWS currently has no authority to stop work undertaken under a licence granted by another state authority. Partly because this woodland was located near the back gate and the road, there was an explosion of protest. Shannonside Radio reported that “We have 10 calls from Newtownforbes people distressed this morning”, listeners drawing attention to the “large amount of woodpeckers there are in danger as are the cuckoos and other birds and wildlife who live in the area”. “Please do something – it’s appalling what’s going on – there are wild animals scampering out in the road”. Even a sequoia went down, although when the controversy began this year the Forest Service sought and received a map on April 1 of the sequoias from Scottish Woodlands with the statement “I can confirm the sequoia will not be felled”. One sequoia circled on the map as protected had already been felled. 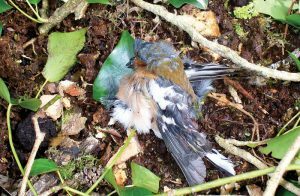 Nor was it lost on the public that two local farmers had recently been fined in Longford Court for hedgerow destruction during the bird-breeding season. More than 8,000 people viewed photograph of birds killed during the works published on the internet. Mark Connellan emailed Shannonside Radio, saying that “claims that certain bird species were being put at risk” meant that: “There may therefore be an implication that the Estate has acted in some way which is irresponsible or inappropriate – and if so these allegations were utterly without foundation” and “entirely baseless”. The “Estate has acted at all times properly”, the statement from the man who is the County’s State Solicitor said, implausibly. Scottish Woodland wrote to the Forest Service that they would of course co-operate with the statutory requirements. However they added the arrogant telltale rider, “provided they were reasonable”. On 17 May, Minister Creed announced that no further felling was to take place until September, but expressed absolutely no concern about what would happen then. While strangely no further felling has taken place, a witch hunt to find who is providing photographs and information on the destruction increasingly corrodes the demesne, where working conditions are described as “just like Downton Abbey”, the BBC period drama of British aristocracy and their servants in the early twentieth century. And there is no sign that the underfunded and legally frail NPWS, a dysfunctional Forest Service, a Foundation sheltering behind Lichtensteinian anonymity, or even a property-protective Parliamentary system can protect our ancient woodlands. As Village was going to press, the harvesting machines were moving back into the woodlands. Tony Lowes is a Director of Friends of the Irish Environment.